Getting meat without killing animals is a concept that’s fast approaching reality. Lab-grown, or ‘cultured’, meat could resolve many of the environmental and ethical problems of the modern food industry. As unpalatable as it sounds –pioneering research is underway with at least 30 laboratories around the world involved in ‘in vitro’ meat research, including Tel Aviv University. But is there a market for ‘franken-meat’? To encourage development, Barak created the non-profit Modern Agricultural Foundation. He’s teamed up with Tel Aviv University and Amit Gefen, an expert in tissue engineering, to study the feasibility of producing of lab-grown chicken breast. Unlike privately held companies working in the field of muscle tissue growth, Gefen’s team will make their research findings available to the public. 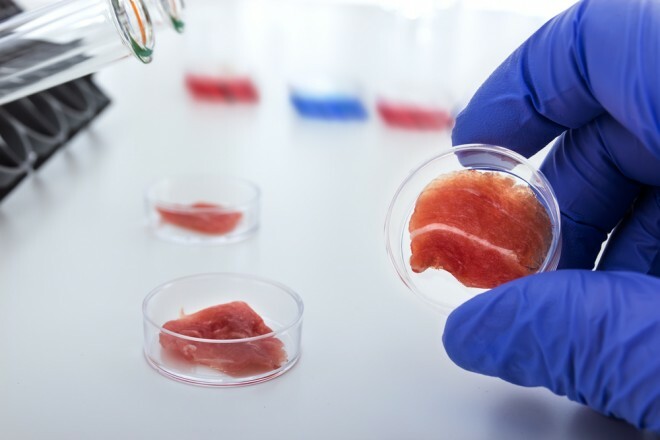 The results will assist manufacturers and investors in determining how best to commercially produce cultured meat and identify challenges to scalable production. The science underpinning the culture of synthetic protein developed out of stem cell research, which sought to develop new methods of regenerative medicine to treat human injury and disease. In 2002, as part of a program to find new sources of protein to feed astronauts, NASA-funded scientists successfully grew goldfish muscle cells in a laboratory setting. Soon after, at an art exhibition in Nantes, France, tissue engineers at Harvard University exhibited a specimen of new muscle grown from frog cells. In 2011, Mark Post, a vascular physiologist at Maastricht University in the Netherlands, was working on an EU-funded project to create synthetic meat, when he received a (then-anonymous) donation exceeding $330,000 from Google cofounder Sergey Brin to accelerate the project. In 2013, Post unveiled the world’s most expensive hamburger, engineered from a small sample of cow muscle stem cells. Post fed the cells a a growth mix of sugar, amino acid, and cow fetus blood, enabling them to multiply and create muscle tissue. He added beet juice and saffron to improve the coloring of the new fibers, and breadcrumbs and egg powder to create a mincemeat texture. “Twenty years from now if you enter a supermarket you will have a choice between two identical-looking products. One will have a label that says it has been produced with a lower environmental footprint, the other will have a smoking-type label that says animals have suffered or been killed to produce this meat,” Post told reporters at the time. As scientists work to perfect production techniques, environmentalists and animal rights groups debate whether lab-grown meat is a Utopian ideal or a distraction from ongoing campaigns to cut our meat consumption by moving towards a grain and vegetable-based diet. Synthetic meat offers the tantalizing prospect of – one day in the future – reducing the environmental impacts of meat production and eliminating the animal suffering embedded in industrial agriculture. The same can be said about vegetarianism, today. Thanks , I have recently been looking for info about this topic for a while and yours is the greatest I’ve found out so far. Love your last line, William. Thanks for the great comments – ! Personally I think it is a great idea as long as we are absolutely positive that the Franken foods being produced do not lead to humans having Franken babies in future generations and an increase in numbers of existing diseases, cancers etc. Science in many cases has turned the population of this planet into one gigantic petri dish supported by commercial interests. Their only concern is for their bottom line today and into the future. Does anyone really believe that mega corporations care about the pain and suffering of animals? I doubt that very much. The corporate gangsters are not down in the slaughter houses, they are in the steak houses.